Plant lovers are familiar with peat moss as the major component of potting mix, but harvest of the material is becoming unsustainable. Not only is peat being removed faster than it can re-form, its use in potting mix contributes to the release of carbon dioxide into the atmosphere. "Peat bogs naturally store carbon. When peat moss is harvested, there's a transfer of a global carbon sink into a net source. That's because within a couple growing seasons, most of the peat moss from the potting mix is either mineralized by microbes or thrown out and decomposed. Either way, carbon dioxide is released," says Andrew Margenot, assistant professor in the Department of Crop Sciences. In a recent study, Margenot and colleagues from the University of California, Davis investigated a material called biochar as an alternative to peat moss in potting mix. Similar to charcoal, biochar is produced through a process called pyrolysis, or heating to high temperatures in the absence of oxygen. And like charcoal, it can be derived from virtually any organic substance. "In our study, we used one made from softwoods from selective logging. But biochars can be made from corn stover, switchgrass, and lots of other organic waste products," Margenot says. "Biochar could even be made from a greenhouse operation's own waste, if there are trimmings from plants or old peat moss." Margenot emphasizes that 'biochar' refers to a very broad class of material that can vary greatly in its properties depending on the pyrolysis temperature and the feedstock used. When organic material decomposes naturally, the process releases carbon dioxide. But biochar decomposes very slowly - potentially on the order of centuries - so when organic material is turned into biochar, the carbon is essentially sequestered and can't escape back into the atmosphere. But how well does it work in potting mix? 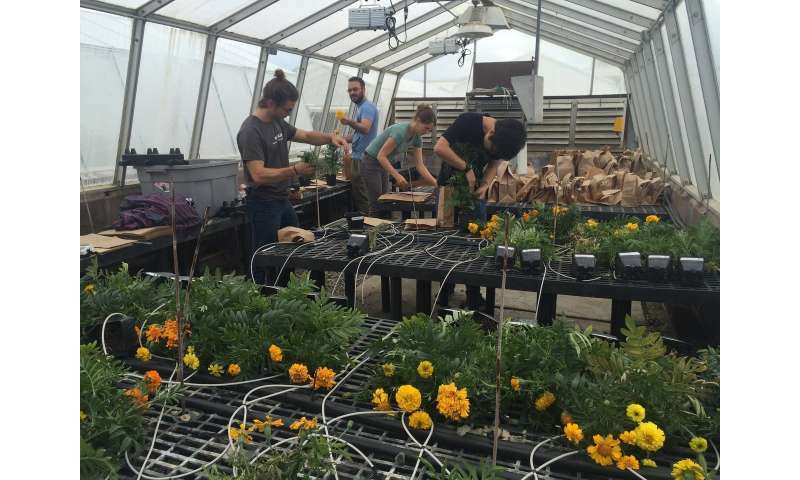 To find out, Margenot and his team grew marigolds from seed to flower in a number of experimental potting mixtures that replaced peat moss with an increasing proportion of commercially available softwood biochar. In the biochar mixtures, pH soared. "The ones with lots of biochar had a pH up to 10.9, which is ridiculous for trying to grow things," Margenot says. But this wasn't unexpected for the type of biochar the researchers used. Marigolds grew and flowered just fine, even when biochar replaced all of the peat moss in the potting mix. However, for plants growing with high concentrations of biochar, the early stages were a struggle. "You could see that the plants took a hit in the early stages of growth - the first two to three weeks. They were shorter and had less chlorophyll, indicative of a nitrogen deficiency, which you'd expect at such a high pH. But these plants caught up by the end. By flowering stage, there was no negative effect of biochar versus peat moss," Margenot says. Not only did the plants suffer no long-lasting negative effects of the biochar, the pH in those pots neutralized by the end of the study. Margenot thinks this could have been due to a natural process of ion exchange between plant roots and potting mix, naturally occurring carbonates in the irrigation water, or the use of industry-standard fertigation - irrigation with low levels of dissolved nutrient ions such as nitrate and phosphate - in the experiment. Although he only tested one type of biochar in one type of plant, Margenot is optimistic about the promise of biochar in nursery applications. "Because we used a softwood biochar known for its high pH, we really tested the worst case scenario. If it could work in this case, it could probably work with others." The article, "Substitution of peat moss with softwood biochar for soil-free marigold growth," is published in Industrial Crops and Products.